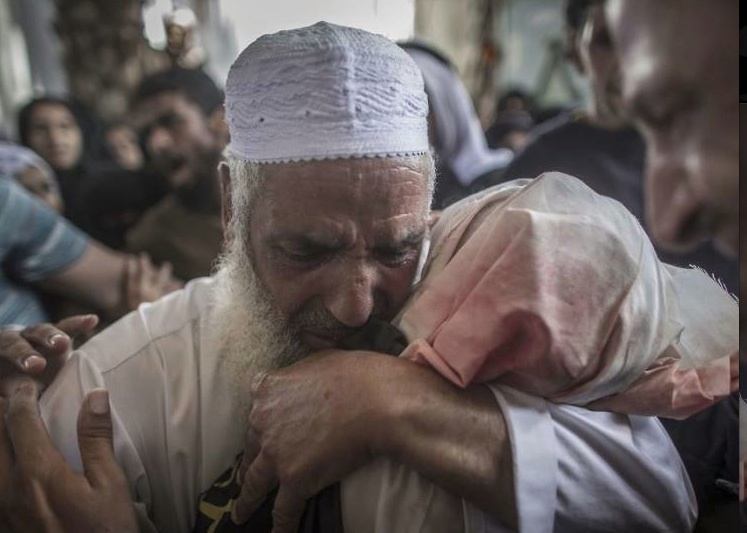 There have for days been many photos of burials & grieving in Gaza–often multiple burials. The most wrenching have been of children being buried or weeping for family, neighbors, & playmates–or of parents wailing for the loss of children, like the family who lost four young sons yesterday, bombed while they played football on a Gaza beach. There’s something about this man’s grief that is particularly powerful. He is holding the body of 4-year-old Sara Sheik el Eed at her funeral in a village outside Rafah. She was killed in a bomb strike along with her father & uncle. This mourner is among her relatives. This is not just the face of Palestinian bereavement; it is the face of 66 years of ethnic cleansing & Israeli genocide. When Israel targets children–& the bombing of four small boys playing soccer on a Gaza beach is only the latest instance making crystal clear they target children (even a NY Times reporter acknowledged that)–it is to break the spirit of men & women like this who’ve been fighting intifada since 1948. Taking out the children is to destroy the younger generations of intifada. That’s why it’s called ethnic cleansing. For most of those 66 years, Palestinians stood alone against one of the mightiest military apparatuses in the world. They’ve witnessed thousands die, thousands driven off their lands into exile or refugee camps, thousands carted off to the Israeli gulag, thousands of family & kin die under the tyranny of Israeli apartheid. And against all odds & very much alone, they stood steadfast. Something is changing now–dramatically. And it is the thunderous sound of solidarity from every corner of this globe: from El Salvador, South Africa, India, Morocco, Algeria, Kashmir, Ireland, Italy, the UK, US, France, Norway, Scotland, Israel, Canada, Yemen, Spain. And we know that if these countries weren’t under siege, we would see massive solidarity in Egypt, Afghanistan, & elsewhere. But Zionism has been riding high for 66 years, inspired by the schmaltz of Andy Williams singing “The Exodus Song”. It’s time to change the soundtrack to Roger Waters “We Shall Overcome (for Palestine)”. All out in solidarity: Stop the massacre in Gaza!